The new Ugly's™ Electrical Safety and NFPA 70E® is your handy reference guide for jobsite and worker safety and compliance. 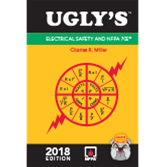 Ugly's Electrical Safety and NFPA 70E is the leading safety compliance reference pocket guide for electricians, engineers, inspectors, contractors, maintenance personnel, and field practitioners. Based on the 2018 edition of NFPA 70E, Standard for Electrical Safety in the Workplace®, this updated publication provides an overview of how NFPA 70E and OSHA regulations are related, and revised and expanded coverage of the latest protective strategies, programs, and procedures. Ensure jobs comply and workers are protected from electrical hazards using updated Ugly's™ Electrical Safety and NFPA 70E®. Pocket-sized for easy reference and portability, Ugly's Electrical Safety and NFPA 70E is a handy reference manual for electrical safety and code compliance. Based on the 2015 edition of NFPA 70E®, Standard for Electrical Safety in the Workplace®, this new edition summarizes current OSHA regulations as well as requirements in the 2014 National Electrical Code®. Pocket-sized for easy reference and portability, Ugly's Electrical Safety and NFPA 70E is a handy reference manual for electrical safety and code compliance. Based on the 2012 edition of NFPA 70E®, Standard for Electrical Safety in the Workplace®, this new edition summarizes current OSHA regulations as well as requirements in the National Electrical Code®. Designed for electricians, engineers, contractors, designers, maintenance workers, inspectors, instructors, and students, Ugly's provides fast access to the most commonly referenced sections of the latest NFPA 70E and related safety standards.